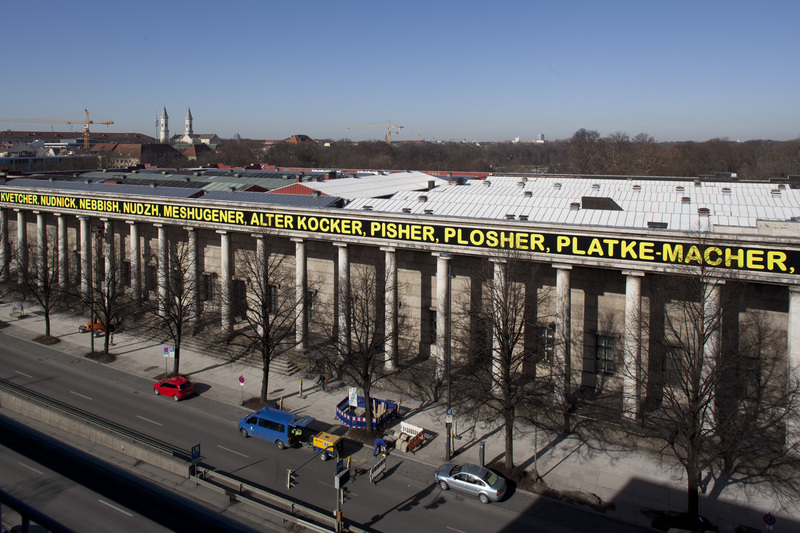 The classicist columns of the gallery opened by Nazi bigwigs in 1937 are festooned with banners bearing slogans. 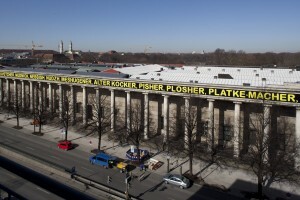 The Nazis, too, used banners – banners denouncing Jewish or pacifist artists: “A Mockery of German Womanhood,” and “An Insult to the Heroes of the World War,” announced the walls of the “Degenerate Art” exhibition in 1937 in judgment against the expressionist, Dadaist, and surrealist works that the Nazis had put on display to denounce modern art in general. The banners of today feature yellow text on a black background. Wasn’t yellow the color of the star that Jews were forced to wear under the Nazi regime? It was the same yellow that the Dresden linguist Victor Klemperer wrote “still signifies plague and quarantine today and which, in the Middle Ages, was the identifying color for Jews, the color of envy and of bile in the blood, the color of suspected evil…” How does it now come to pass that the color of “evil” suddenly stops being a color, emerges from the background, and flows into the shapes of letters, and becomes a symbol, and from this symbol language emerges, and that language is … Yiddish?